Old school, upscale pyjama party for the boy with a nonconformist streak. Printed silk came in billowing silhouettes, whilst classic Valentino elegance was combined a little rebelliously with a very undone sensibility. Wool jumpers were baggy, rubber pool slides were styled with button-down shirts, and a suit came reimagined entirely in camo. Prints prints prints. Decadent and incredibly detailed, the collection was driven by them, from florals and dandelions to stars and animals. 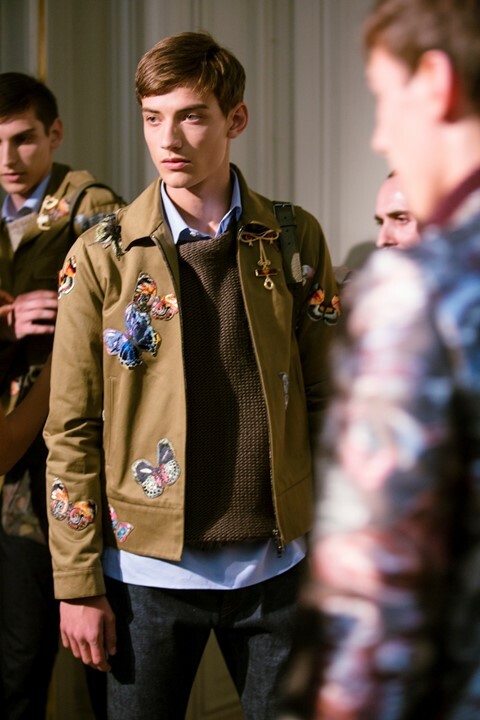 Whilst certainly playful, the opulent fabrics gave garments a refined edge, as did the attention detail – like the beautiful embroidered butterflies covering jackets and coats. Models wore pins on their collars, faces shaped from thick gold wire with jewels for eyes – a little fun and frivolous yes, but at Valentino even the badges exuded craftsmanship.